What better to do on Roberto Clemente Day than to visit the one and only place of the largest collection of Roberto Clemente memorabilia. 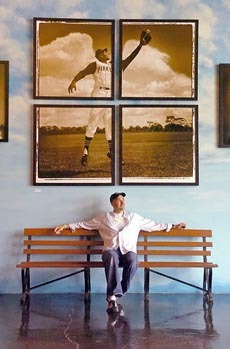 We are yakkin with Duane Rieder owner/curator of the The Clemente Museum. And he seriously wants my autograph DESPITE the fact that I barely made it out of tee-ball as a kid! The 6th Annual Clemente Museum Fundraiser is being held on September 17th, 2015 from 6:00-9:00. Meet legendary sports figures and the Clemente family, including Vera Clemente. Contact Elizabeth at 412-621-1268 or elizabeth@clementemuseum.com to purchase your tickets or for additional information.